WOW! 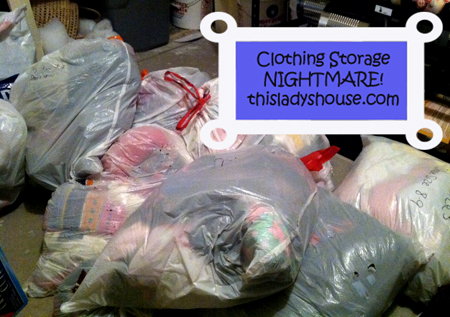 All of a sudden I have 4 kids and, literally, buckets and buckets full of baby clothes! As we have been moving things out of our storage room in the basement to put in our garage I have been trying to find better ways to store all of my junk. When I first started having kids I had this amazing plan to have one large tote for every size of clothes my kids wore. It didn’t take long before I realized there was no way I could store that many totes in my one little storage room. So, in an effort to save space I started putting my kids clothes in plastic bags. When I took the bags off the shelf to move out to the garage I noticed they had holes in them and stuff was falling out, getting dirty, and disappearing. Not sure what to do I pulled all of the bags off the shelf and threw them in the middle of the storage room. They sat like this for a week or so while I tried to figure out the best method for storage. Plastic bags were out of the question but individual totes were out of the question too. I really needed a way to keep the clothes clean but I really liked the idea of having them separated by size. My solution: Mesh laundry bags from the dollar store. 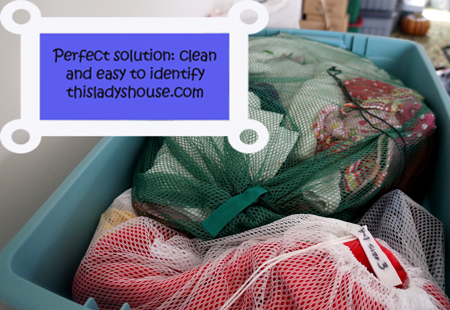 Now all of my clothes are in mesh bags by size and gender and the mesh bags are stored in large totes so they stay clean and are easy to stack. 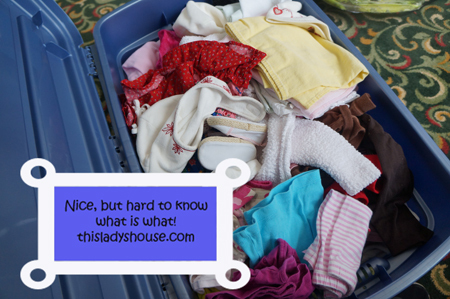 When one of my little kids needs new clothes all I have to do is read the outside of the tote, find the size I am looking for and remove the mesh bag with all the right size clothes neatly stacked inside. When the big kids grow out of clothes they go into a new mesh bag and find a home inside a tote on the shelf. So quick. So Easy. So wish I would have done this 5 years ago!